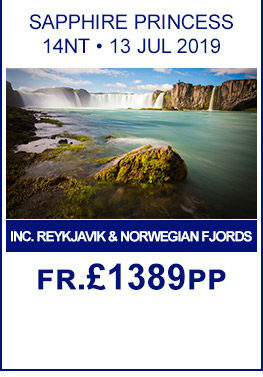 A cruise to Iceland offers visitors a chance to discover a mysterious and unspoilt country, with its vast expanse of beautiful terrains, ice capped glaciers, gushing turquoise rivers, powerful waterfalls, volcanoes and geothermal hot springs and geysers, Iceland provides the perfect destination for a truly unique cruising experience. 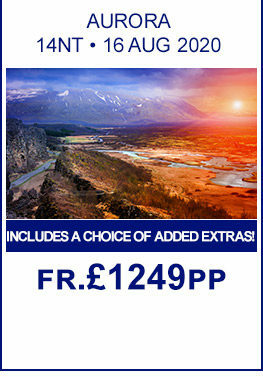 Take a look at our 4 top offers for Iceland! Newly Reduced Prices! , No service charges on all P&O sailings from May 2019! A highlight of many cruise itineraries is Reykjavik, one of northern Europe's most stylish cities and home to a vibrant music and arts scene. 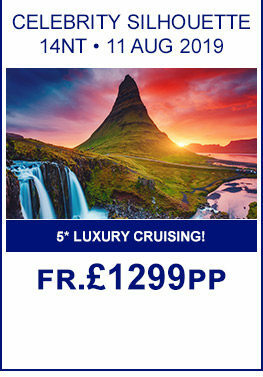 There are many excursions available to visitors on a cruise from Iceland, head to the harbour and join a boat tour for a spot of whale watching, frolic in the Mediterranean-like waters of Nautholsvik Geothermal Beach and after a hard days sightseeing, soak your aching limbs in the Blue Lagoon- voted the best medical spa worldwide. Cruise into Akureyri, a charming town located on Eyjafjordur, stroll through its stunning botanical gardens, pick up a memento at Santa's house, a Christmas store open all year round and take a shore excursion to the beautiful Godafoss Waterfall. Visit Grundarfjordur, one of the oldest villages in Iceland, it lies in a beautiful fjord and is surrounded by spectacular mountains, most notably Mount Kirkjufell and its dramatic surrounding lava field. The town is perfect for those who love the outdoors with activities such as hiking, bird watching, horse riding, fishing, and in winter, skiing and ice climbing. Another highlight on a cruise of Iceland is the fishing port of Isafjordur; this pretty town is rich in art, culture and historical significance. Visit the Slunkariki Art Gallery and the West Fjords Folk Museum, potter around the interesting town centre full of small shops, unique houses and old streets brimming with character and take advantage of the sloping mountains by indulging in many of the outdoor pursuits on offer. The Aurora Borealis or Northern Lights is undoubtedly one of the most spectacular and beautiful of nature's phenomena and on a cruise to Iceland or via Finland, you could be lucky enough to encounter this amazing sight. Travelling to Iceland between the months of September and March offers the best possibility of witnessing the Aurora. 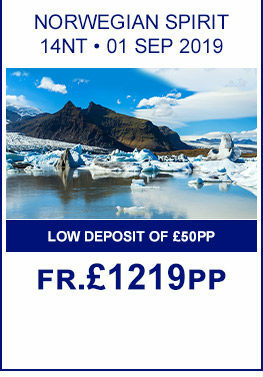 We have a large selection of cruises going to Northern European locations, take a look at our 5 day cruises.